The Hawaii Capitol is a masterpiece of design that reflects Hawaii's scenic qualities. This writer well remembers when the new Hawaii Capitol opened for business in 1969. Working as a student intern for one of the legislators, I knelt down and peered at the underside of block edging for the reflecting pool and discovered little white stalactites under the building. The lime was washing out of the cement. I showed it to my legislator, who worriedly went, "Uh-oh." The building hasn't yet fallen down, so don't worry. 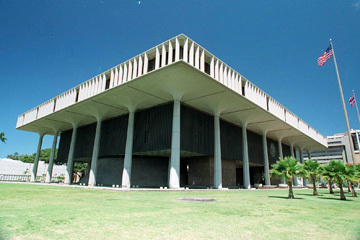 Be happy that Hawaii has a unique state Capitol structure, one that not only is a masterpiece of design, but also reflects Hawaii's scenic qualities. A brochure available from state government Web sites points out that the building is in a volcanic shape, surrounded by water like the island, and the columns rise like coconut palms along the flanks. Groupings of eight columns, represent Hawaii's eight primary islands. The center of the building is open to the elements, and the tradewinds sweep through on a good day, bringing with it the scent of whatever Gov. Linda Lingle is barbecuing across the street at her Washington Place abode. The roof is ribbed like a fish skeleton. Parking is hidden underneath, a nice feature from the design partnership of Belt, Lemon and Lo and John Carl Warnecke and Associates. It's cleverly minimal and uses physical metaphors that are typically evocative in the 1960s Bauhaus school of design -- they loved that fake "color" beige! -- but it's also fairly pan-cultural in its contours. For lack of anything better, the building could be called an example of "Hawaiian Bauhaus Internationalist" architecture. Can you name another? (OK, the airport). The legislative chambers are also fairly volcanic in texture and include chandeliers representing the sun and moon. In the atrium courtyard is a tiled artwork by Tadashi Sato called "Aquarius," which is supposed to represent the changing colors of the ocean. They goofed in installing the artwork, forgetting to slightly crown the center, and for years the spot collected puddles of water before it was ripped up and reinstalled. The Capitol went in for detox during the off-season of 1991, removing asbestos, improving wiring and cables, and tweaking handicapped access. It reopened nearly four years later. The sloping contours of the building, the elevated office spaces, the wide reflecting pool and lawn, and the generally open design all contribute to a factor unimagined when it was built: It can shrug off terrorist bombs better than other state capitols around the United States. Hanging on each side, like Mr. T's bling, are gigantic state seals 15 feet across and weighing nearly four tons. Scattered about are statues and various memorials, all of which are explained to visitors during the daily tours. The building is very much the legacy of Hawaii Gov. John A. Burns, and official paintings of Burns use the building as background.